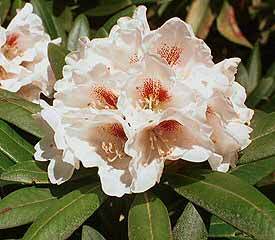 Flower/Truss Description: Funnel campanulate, white with crimson spots, often flushed rose. Inflorescence 10-20 flowered. Foliage Description: Leaves oblong to oblanceolate, 2" to 7" long, matte green, discontinuous upper indumentum layer, brown or dark red, retained 2-3 years. Plant Habit: Compact shrub or small tree. Height: 7 feet in 10 years.